Meet James Wakibia - the ban plastic bag man - a writer, photographer, environmentalist and blogger from Nakuru, Kenya. The FlipFlopi team recently sat down with James to learn more about his incredibly important initiative. A journalist by profession, James has chosen to follow his passion and actively do something to ban plastic bags in Kenya. The inspiration to start this campaign came to James in 2013 as he was passing a dumpsite on his way home. “This dumpsite was based on a slope and whenever it rained, huge piles of plastic bags would wash up on to the road” said James. It was at this moment that a fed up and frustrated James decided to start the #banplasticKE to do something about this ignored issue. James has organised protests to have the streets of Nakuru cleaned up and has started petitions signed by over 5000 supporters. He has captured the attention of publications from all over the world and politicians in Kenya. His hashtags #iSupportbanplasticsKe#banplasticKE have trended on twitter in Kenya three times in the last year with over 2 million tweets. He bravely asks uncensored and direct questions: “What is the responsibility of the supermarkets who issue these bags and what is their role in the environment? They should be at the fore front of teaching their customers, using easy to recycle and reusable plastic bags”. He has not been afraid to take it to the county streets and campaign to have plastic bags banned in Kenya. 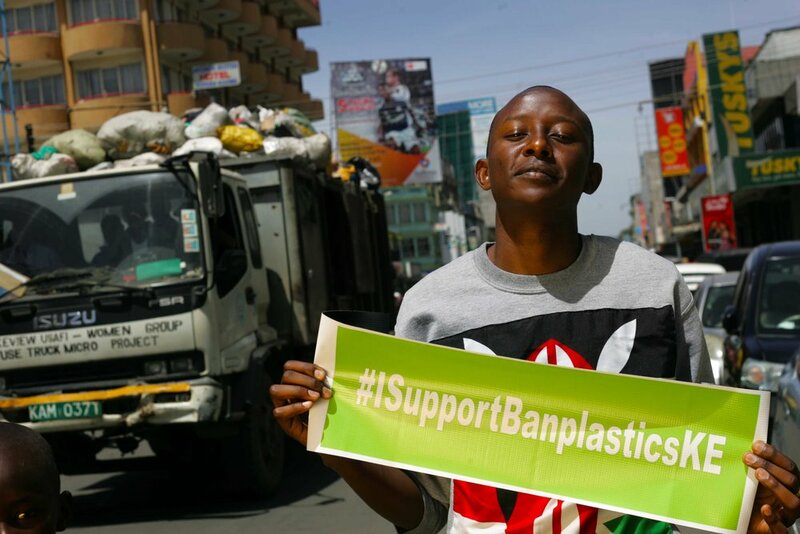 He asks people to support his campaign by photographing themselves with his banner to create awareness of the huge problem of discarded plastic litter in Kenya.